You were having a nice day out until you took a tumble and you’re now bleeding profusely from your knees and elbows …. off to the first aid room you go. Would you accept treatment if the first aid room was a toilet / restroom and the ‘seating/rest’ area was a bed near the toilet that had previously been used to change a filled nappy? I think most of us would be quite shocked to know that first aid rooms at some public venues / tourist locations are being offered up as ‘toilets’ to disabled people? Did you know that disabled people are having soiled pads changed on first aid beds? Some disabled people may be using camping toilets or commodes in the same space. Should this be allowed? Let’s look at the issues. [Article by Louise Watch. Louise has formerly worked for 7 years managing mobile and static first aid posts at public event and venues. Louise also uses a wheelchair and hoist]. There are large numbers of visitors to public events who can not use standard ‘accessible toilets’. On a number of occasions first aiders and ambulance staff have had to help people who have not been able to get up from the toilet or who have fallen – usually because the space has been too small to use safely. Some people need carer support, space, a hoist to transfer from wheelchair to toilet or a bed to lay on to remove clothing, use a catheter, have a continence pad changed. However, venues across the world have been declining to put in suitable toilet facilities known as Changing Places, and instead are telling visitors with these requirements, to use the first aid room. The obvious first problem is that this assumes that older and disabled people are incontinent – and use adult nappies. So they can just lay down on the bed and change, right? Wrong. Most are not, they just need a toilet in a room with enough safe manoeuvring space or a hoist available … and first aid rooms do not have a toilet in them. They also do not have hoists or the space to use them. I have been in hundreds of first aid rooms whilst looking after sick and injured visitors and never once seen a toilet inside. Usually there is a cupboard with medical supplies and a bed, chair, sink and maybe a privacy curtain. So how the offer of a first aid room is going to help continent disabled and older people is a mystery. Are they thinking about supplying a commode or camping toilet? gently curved toilet seats or specific shapes that support hip stability and protect pressure sores. if a person stays in their hoist sling then this is a total body support in itself. Commodes can be dangerous if they don’t match the needs of the person and can cause serious accidents. Commodes also need to be cleaned/emptied between different people and human waste and menstrual blood has to be disposed of correctly. First aid rooms are not equipped for this which means someone will have to walk the filled pan to a nearby toilet to flush away. Will that be staff or visitors? It is also questionable whether hygiene standards for spills and splashes could be dealt with in a first aid room environment. Infection control becomes a big issue that would probably need a full risk assessment. What about people who just need a bed? If a hoist is needed, is there sufficient space for a portable or gantry hoist? In my experience, there is rarely enough room. Infection control is needed if urine, faeces and other fluids are likely to have touched the bed. It might be possible to risk assess alongside the usually assessments for cleaning up body fluids such as blood, vomit and saliva wipe down methods for infection control. This should be in place in a first aid room as standard. Carers/assistants are likely to already be familiar with this when using Changing Places toilets and home facilities. There is, however, a greater risk if a proper cleaning procedure has not been followed by staff or carers – eg if the next casualty to use the bed has open wounds. Equally, an immune compromised disabled person may be at risk if a casualty has used the bench and has an infection and has vomited over the bed as is often the case. I have seen some pretty poor hygiene and infection control practices in first aid locations. Access to a sink for water to clean and wipe the person should be available from the first aid room sink – again infection control protocol could be used and general wipe down procedures that toilet cleaning staff might also utilise. There would need to be access to human waste and sanitary bins not provided by first aid rooms. 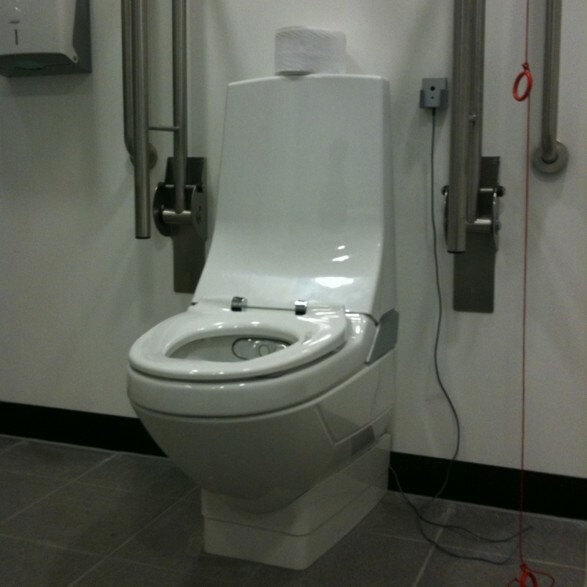 The other challenge to turning your first aid room into a toilet is that it can take 40-60 minutes to hoist a disabled adult onto the treatment table, change and clean them, then get them back comfortably in their wheelchair. Then add on another 15 minutes for cleaning and disinfecting. What if there is a casualty who needs treatment during this time. Both can’t use it at the same time unless you have a first aid room laid out like a hospital with cubicles and more than one treatment area/bed. Should first aid rooms be offered as toilets? In light of the above – no, unless the first aid room is very large and more like an A&E department with staff training to match regarding infection control and clinical waste disposal. Even if I was offered a commode, hoist and private cubicle I would find it insulting and undignified to have to visit a first aid room, where patients might be, to use the ‘toilet’. This would not be equality in terms of bathroom provision. It is certainly not an appropriate solution for the hygiene needs of older and disabled visitors/guests.